Spring is in the air all over the Blogosphere! 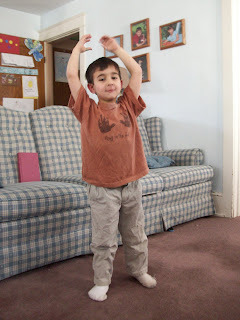 I love this post on The Imagination Tree about making a play garden. I really want to set up a little area like this! And Keeper at Home has a great post on how to plan my garden. March comes in like a lion and goes out like a lamb… or so goes the familiar saying. At our house, we’ve been having fun predicting at breakfast whether it will be a “lion day” or a “lamb day.” On our daily walk, we look for signs of spring, or remnants of winter. Here are some fun lion and lamb activities to see you through March. Make lion and lamb fluffy pillows (you will probably have to cut and paste this link). You can revamp the instructions to use natural materials. We’ll add more as the season moves on. The kids will find items from nature, the seeds in the dish garden will (hopefully!) sprout, and we’ll add our own crafted items from Spring Seasons of Joy and other sources. But here is the beginning of our spring nature table. What color under your footstep glows? It’s not a rose, but it will do for now. Five little flowers growing by my door. I picked one, and then there were four. Four little flowers I did see. I picked one, and then there were three. Three little flowers, pretty and new. I picked one, and then there were two. Two little flowers out in the sun. I picked one and then there was one. One little flower growing in the sun. I picked it too, and then there were none. 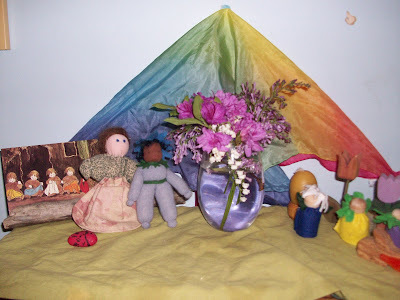 Oh, I love the Flower Fairy circle time from Spring Seasons of Joy. I think Nicholas and Daniel really do as well. We had fun sitting on silks and pretending they were flower buds that turned into little fairy boats. Down came the rain and the rain became a flood! And the itsy bitsy fairy, in a puddle she did float. 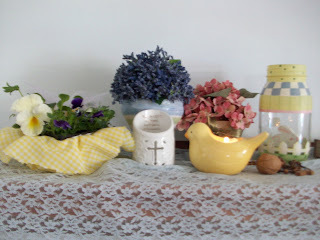 We’ve expanded out beautiful flowers on the mantle to include some pansies we won at the church potluck on Sunday. The walnut, Nicholas found in the yard. Here’s Nick, “giving a little sunshine”. You can find the complete “Dig a Little Earth” circle, along with four others, in Spring Seasons of Joy. For only $15, this curriculum guide includes 10 weeks worth of circles, stories, painting, modeling, coloring, nature table crafts, playtime activities, and much, much more!